All kinds of things as usual. David Kracov’s sculpture – The Book of Life. Travel pieces for my travel writing unit. Shark Net by Robert Drewe. This book is probably not something I would have chosen left to my own devices, but that’s a good thing I believe. I saw Robert Drewe speak and read some of his work at the opening of the Coffs Coast Writers Centre a few weeks ago. I loved his style – personal, dry and humorous – and decided it was time to read one of his books. Shark Net is a memoir of his childhood in 1960s Perth, a city even more isolated than it is now, and the effects on both himself as a boy and the city as a whole when a killer went on a murderous rampage, killing eight random people in all kinds of different ways. I haven’t gotten to the murders yet, but so far I’m enjoying visiting Perth and Australian society 50 years ago – a place so different it could be another world. About Sir Nicholas Winton, who passed away this week, aged 105. Just before World War 2, he and his mother set up a refugee program and saved 669 Jewish children. in 1988, the BBC invited him to a show called “That’s Life”, and unbeknownst to him, filled the audience with the now adults whose lives he had saved. Very, very cool. About parenting in the digital age with Glennon from Momastery. She keeps her 12 year old boy safe on the internet by taking his phone every night and going through all his texts and other online wanderings. I’m not sure I agree with how she does it, but it sure is useful to be having a conversation about it. The comment section is very interesting, as I am sure you can imagine. Our bodies may be made of stardust but our souls are made of stories by Jamie Wallace, one of my favourite bloggers. I loved this beautiful little piece, written on the fly in place of her normal weekend edition. The thing is though, we do lie to ourselves – all the time. Whenever we create a story around events in our life, whenever we blame other people for our lives and the things that happen to us, whenever we take outside events and other people’s words and actions personally, we are in some way lying to ourselves, or at least telling ourselves only part of the truth. This is the ego’s way of protecting ourselves, we all do it, and it’s a difficult habit to break. Owning up to the truth is hard. It really is. It’s important though, because if we cannot have an honest relationship with ourselves, then there is no way that we can have an honest relationship with anyone else. We may even find ourselves attracting people who are liars, just so that we can focus on developing honesty in our own life. The more you know yourself, warts and all, the more you develop an honest relationship with those around you. First up, you probably won’t like the answer. It will sting for a few hours, or even days if it’s a big truth that you’ve been avoiding for a long time. After the sting fades though, there is space. And in that space is clarity, freedom and power. For the first time, you see the situation as it really is and start to take responsibility for your life. You step into the driving seat; now you are deciding where to go and which route to take, you are steering, you are choosing when and how much to brake and accelerate and you are choosing the music. Not your parents, not your siblings, your partner, friends, colleagues or anybody else. You. This is an excerpt from a chapter that is currently a work in progress. My way around online study and my first semester of University. I really could not have asked for a better start – with the kids away and the morning to myself, I didn’t have to get up ridiculously early, but I was ready to begin by 7am – a very relaxed start for me. My first unit is Storytelling and Genre Writing, focusing on travel writing. So fun :). I did my readings for that subject, checked out all of the assignments for that and my other subject, Media Convergence and Culture, as well as doing the tutorial.and answering questions in the online forum for my media subject. Also – so fun :). The lectures for both subjects weren’t until later on in the week, so I had time to learn my way around the online campus, plan out my semester and begin thinking about my assignments. It’s so different studying at my age (late 30s) than in my teens and twenties – I had no idea about time management when I was young. I swear, University is wasted on youth. Oh, not really, you know I don’t mean it sweet young things, but I just didn’t have the discipline and organisation when I was young that I have now, and I’m willing to bet that you didn’t either. So, my nerdy, University studying, learning self is satisfied, deeply satisfied this week :). Having my cake and eating it too. The end of the school term tends to form a sort of unholy nexus for me, because it is where motherhood, my work and my community obligations (P&C) intersect. The end of every term has a degree of intensity about it but this term had a special edge because of school reports, a large P&C fundraiser and an end of term sleepover and campout for NAIDOC day (National Aboriginal and Islander Day). To top it all off, when I confided in a friend about a poor result in my son’s report, she responded by criticising my mothering style and my son. Have I mentioned that I don’t take criticism well? So. I needed a holiday. We needed a holiday. And oh my, the Universe has really turned it on for us. This week has just been golden. The kids began their holiday with a two night sleepover at their Godfather’s farm 10 minutes up the road. It was just going to be one night, but they were having so much fun driving tractors, exploring the farm, lighting the fires and having their bellies filled with all of their favourite food and treats, that they didn’t want to come home. Knowing they were so happy freed me up to just wind down and chill out. I made the happy discovery of Orange is the New Black (OMG how good is it? Now I have three seasons to catch up on 🙂 ). I reinstated my yoga practice which had been sorely neglected of late, cleaned my house, caught up on the washing and started University. By the time the kids came back my equilibrium had been completely restored. We’ve been to the movies – we saw Inside Out, which is just the most beautiful, clever and inspiring children’s film I have seen in a long time. 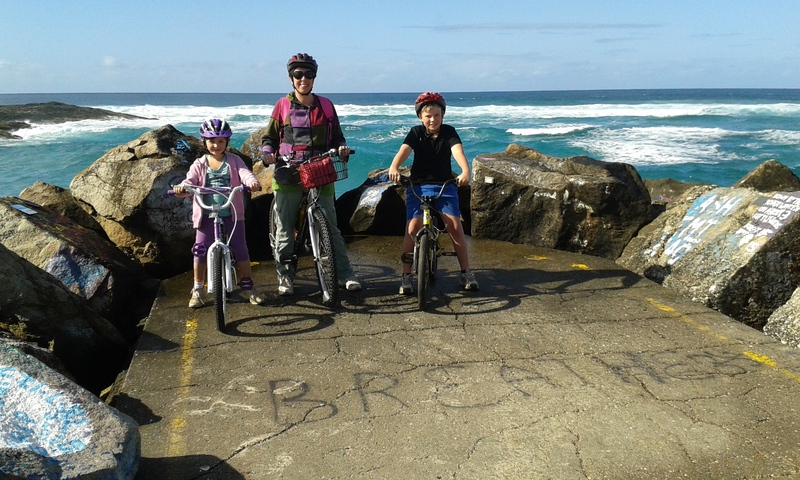 We also went on a much anticipated bike ride, just me and the kids, along the river at Nambucca Heads. This is the first time both the kids have been old enough to navigate the roadside path, pedestrians and other obstacles in urban riding, and we just had the happiest time. We posed for a photo at the end of the v wall, our halfway point framed by ocean spray, and I thought to myself, these are the best days <3. We finished off the ride with a delicious lunch at Nambucca’s newest eatery, Wharf Street Cafe. Right on the water, delicious food and OMG the macaroons. Our new favourite place to eat. Today is a rest day, and then tomorrow I am stealing another day for myself and heading up to the Bello Winter Music Festival with a friend. Yippeeeee 🙂 See what I mean? Golden. Twitter – follow me on Twitter to see all of my other best reads and quotes that don’t quite make it on this blog, but are still awesome – I love a chat too, so come visit 🙂. Been there, done that. (I’m sure I still do that.) What I notice is that when I become aware that I might be behaving this way at first I resistant, And then I say to myself, “What’s the big deal? So now you’ve learned something and that’s a good thing.” It’s amazing to see the resistance before I get to that point, though. And I suspect that I am blind on a variety of issues. Yes, Georgia, so true! You’ve nailed the process perfectly! First resistance, then questioning, then realisation, acceptance and learning. The resistance is the bit that so many people can’t get past, and it is painful (for the ego) but so necessary. And yes, I suspect that I am blind on a wide variety of issues as well – although I have faith that the Universe will help me open my eyes when i am ready :). I also really like what you wrote about Honesty = Power. That is SO true on SO many levels, and something I believe each of us struggles with. 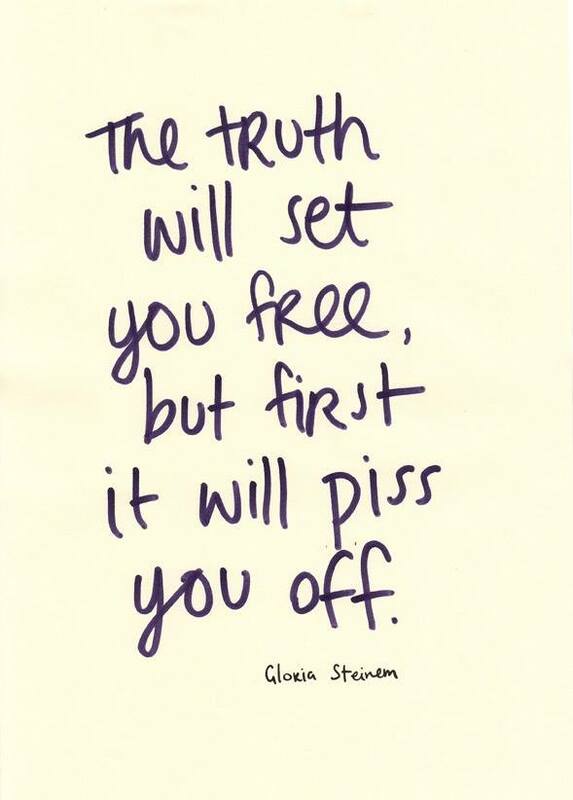 Truth is always the simplest answer, but it can also be the hardest path. One step in the wrong direction can require a mile’s worth of steps to get back to where you should be. Deceit, whether of others or ourselves, creates a strange kind of warp, like a wormhole in space. One tiny word gone astray, one small reality manipulated to suit our own needs, and suddenly our whole world changes. I hope you’re enjoying your weekend – is everything okay after last weekend? What you wrote inspired me, Sara, and I love your example – that’s just what I meant. Perfect! Thanks for checking in. We’re good. My (very) late weekend post explains one piece of the situation, and the more personal/emotional side of things is, well, hopefully settling. It’s all part of the journey, right? I’ve been listening to an audio book called Buddhism for Busy People (am I repeating myself? ), and I’ve found that it helps me to have a broader perspective. Baby steps. Baby steps. Oh, great! No, it’s brand new – only hours old. I’m glad you like it – it’s different, but more functional for the writing I’m doing here. Hey Lillian, you are so right – better to take the small sting now rather than the kick in the guts later :). It’s all about minimisation of suffering when you think about it! And thank you for that positive but real compliment – I’ll take that because that’s really what I’m about! Thanks for seeing me <3. So pleased to hear you had a satisfying start to your new university life, and that you shared the highlights. I’d forgotten until you mentioned it that travel writers were my go-to before blogging. Wonderful diversion for being an armchair traveller Sagi. Speaking of which, another Sagi trait is no matter what I’m thinking, the truth has an uncanny knack of making itself apparent directly via the words out of my mouth, and to me who it’s often new news as well! What glorious winter weather we’ve been having. Perfect for having your cake and eating it too as evidenced by your pic at the V-Wall. I’m excited about the new Wharf Street Café. One of my favourite locations. Hey Dale, you are going to love that new cafe. I’m so pleased that the owners have opened another cafe in the valley – they used to own the watermark cafe (when it was good). Gorgeous weather – although a little frosty with these clear skies! I love your ‘chapter in progress’…keep progressin! 🙂 Your writing of the truths of honesty, the role of meditation-type practices are truths to be shared, and shared, and shared again! Reading: I am enjoying reacquainting with our bookshelf. Wintery evenings in front of the fire gazing the must-keeps, old favourites, been there a while but yet to read and other titles that wave their welcome back hand to me. Broome writer, Jacqueline Wright, Red Dirt Talking: re-reading for the 4th time (love it), gardening books as I soak up inspiration for winter gardening enthusiasm, and Edward Curr ‘Recollections of squatting in Victoria’ (a special 18th century account of life lived in Victoria in that era, with special descriptive accounts of indigenous life). I love reading in Winter. The new format is fantastic – it showcases the wonderful inspiring images and sharing’s that are central to your blog. And school holidays – oh so special. Great to hear yours are going along wonderfully on so many levels. Breath – what a beautiful blessing for your families school holiday bike riding adventure. Thank you so much Kate, I’m glad you enjoyed my writing on honesty ❤️. The new format has been a bit of a hit – so many more people are looking around. It was just one of those spontaneous ideas of mine – a good one it turns out! I love winter reading – it’s such a nourishing activity. Your books sound wonderful, thank you so much for sharing them with me. Breathe 🙂 Love it! 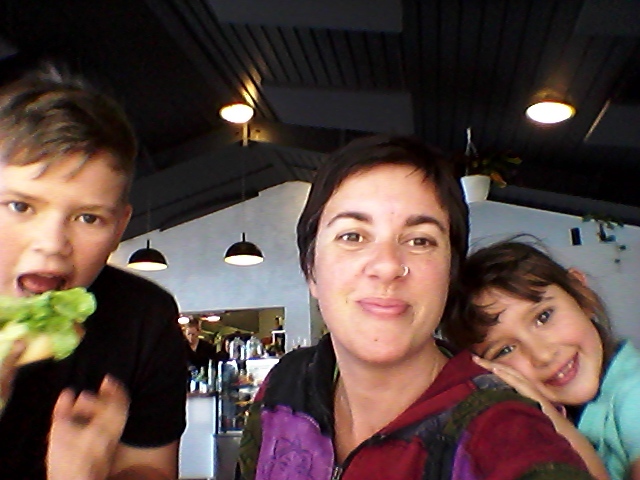 The school holidays have been so good, I have to keep pinching myself – second week and all! Sara, do not waste another moment worrying about your son’s report. All the tests and evaluations children are subjected to today are completely ridiculous. He looks like a lovely boy. Just encourage him to go his own way. Now that you are busier than ever (I’m always amazed at how much you do and read and see) perhaps he can keep you company sometimes while you do your school work, reading something that interests him. Dear Diana, thank you for your kind and immensely reassuring words and you’re totally right. The one size fits all assessment most schools do is terrible. It’s not his assessment results that have his teachers cranky though, it’s his attitude. He likes to cruise :). And…he’s outgrown his little school, but it’s only six months until he goes to highschool and how he does now will determine what classes he goes into. I am not truly worried – he’s smart, likes to read and is competent, just a little lazy and argumentative :). It will be a fun six months :). The new theme works really well! And I love your logo up top…is that new also? We recently saw Inside Out too, and thought it was great. They did such a good job of showing how all our parts come together to make us who we are…I think we each took something different from it (me + my kids), but it definitely had a lot to offer. I think I’m being driven by overwhelm these days… is that even an emotion? I got this picture of overwhelm as all of the emotions packed into a room that is way too small…sit tight Elysha, it will pass! Hey thanks – and yes, the logo is new – I whipped it up yesterday. I am no graphic designer, but I saw an image in my head, and just tried to recreate it. I look at my blog and I think, why didn’t I do this before? Hi David, I hope you enjoyed your 4th of July celebrations :). Honesty, and the degree to which we are or not, has to be one of the most difficult of questions to answer well. We see everything so subjectively don’t we? I guess your thought that we are as honest with ourselves as we can bear, is as much as we can hope for…and indeed, that we can bear a lot. I like to picture you as a student and then a graduate school teacher with your love of learning but rebellious independence :). As I am studying online, I don’t have to attend classes, and I must say I do love that :). It’s chilly, and I am wearing about seventeen layers and a hot water bottle in my lap (my studio is unheated) but I love the freedom to come and go as I wish. Everything is interesting to me at the moment, but maybe I shall become more critical of my lecturers as I go on :). Enjoy your week. LOVE the book image. I looked up the company that does those books once, they are amazing! My magical world lol 🙂 I don’t know that it is any more magical than yours, Dawn (I didn’t get tweeted by the head of Microsoft or featured on huff post today) but I’m glad you enjoyed the little sneak peek :). Thanks Andrea – so far so good! Simple does not mean easy I have found, dammit! Practice though, practice!